Jordan Brand has plans to release multiple Air Jordan 4s in celebration of “Singles’ Day,” November 11. 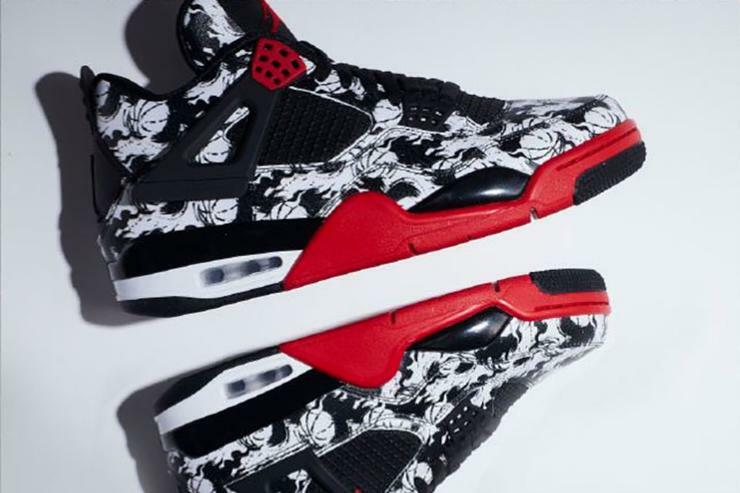 Nike officially introduced one of the special edition Air Jordan 4s as part of their 2018 Women’s Holiday Collection, revealing a “Fire Red” colorway that highlighted by the following feature: A creative expression or rubbed off organically with regular wear, a second layer on the upper reveals an ornamental design.Another all-new Air Jordan 4 also features a black & white graphic print on the upper. Coined as the “Tattoo” Air Jordan 4, these kicks will release exclusively in Greater China on 11/11, followed by a World wide release on December 29. Singles Day is a holiday popular among young Chinese people that celebrates their pride in being single. The date, November 11, was chosen because the number “1” resembles an individual who is alone. Take a look at the newly unveiled “Tattoo” Air Jordan 4 in this posts and stay tuned to this site for more news about the 2018 Women’s Holiday Collection. Singles’ Day or Guanggun Jie literally: “Single Sticks’ Holiday”) is a holiday popular among young Chinese people that celebrates their pride in being single. The date November 11 was chosen because the number “1” resembles an individual who is alone. The holiday has also become a popular date to celebrate relationships, with over 4,000 couples being married in Beijing on this date in 2011. The holiday has become the largest online and offline shopping day in the world, with Alibaba shoppers exceeding 168.2 billion yuan (US$25.4 billion) in spending during the 2017 celebration. Chinese Bachelors’ Day or Singles’ Day, originated at Nanjing University 1993. Singles’ Day celebrations spread to several other universities in Nanjing during the 1990s. The holiday was named “Singles’ Day” because its date, 11/11 (November 11), consists of four “ones,” representing four singles. There are several theories explaining the creation of the Singles’ Day festival.The most widely accepted theory is that the holiday grew out of Nanjing University’s dorm culture. One origin story is that in 1993, four male students of Nanjing University’s Mingcaowuzhu (“All single men”) dorm discussed how they could break away from the monotony of being single and agreed that November 11 would be a day of events and celebrations in honor of being single.These activities spread through the university and eventually made their way into wider society. The spread increased with social media use, and the event has become increasingly popular within contemporary Chinese culture and society. An apocryphal theory is based around the love story of a Nanjing University student called Mu Guang Kun, known as Guang Gun. The story goes that his girlfriend was diagnosed with cancer during his second year at the university and eventually died. The distraught Guang Gun took to placing candles on nearby rooftops in memory of his lover, and on his birthday in the subsequent year, his roommates joined him to keep him company. After this, the day became a holiday at the university and grew to become the national, commercialized festival that is celebrated today. Singles’ Day serves as an occasion for single people to meet and for parties to be organized. The holiday was initially only celebrated by young men, hence the initial name “Bachelors’ Day.” However, it is now widely celebrated by both sexes. “Blind date” parties are popular on this day, in an attempt to alter the single status of the participants. Some universities organize special programs to gather singles together for the celebration. Singles may take on an annoyed or self-deprecating attitude in response to remaining single as a university student, but university initiatives have helped curb that negativity.Although this date is meant to celebrate singlehood, the desire to find a spouse or partner is often expressed by young Chinese people on this date. 2011 marked the “Singles Day of the Century” (Shiji Guanggun Jie) as this date had six “ones” rather than four, increasing the significance of the occasion. In 2011, an above-average number of marital celebrations occurred in Hong Kong and Beijing on November 11. The Air Jordan 4 WMNS Singles Day is a new and special colorway to land on the silhouette, honoring the popular Singles’ Day holiday in China, where young citizens celebrate the idea of being single. Covered in an official theme of Fire Red, Summit White and Black, the sneaker’s leather upper is also highlighted with a special ornamental motif on the toe box, which is revealed over time after wear. Finally, black accents throughout and a gum rubber outsole completes the design. Look for this Air Jordan 4 at eBay commemorating Singles’ Day, November 11 for $299. If you consider yourself as a passionate online shopper like myself,eBay has amazing deals on the best products and exercise equipment . I hoped you enjoyed theAir Jordan 4-WMNS Singles’ Day article and if you have any questions about the post want to leave a comment or want to leave your own personal review, please leave a comment below . A good write up on singles day in China. Personally, I don’t like the advertising slots going away from the subject but a good layout.